Proud of you Israel ..! About time too .. BDS lies have been spread far too zealously ..
terrific - good on them. however, the BDS movement could hardly be described as pro-palestinian: too much of israel's economy benefits palestinians for that to be the case, so that boycotting israel in effect also boycotts and potentially disadvantages palestinians. BDS is fairly blatant anti-semitism, rich in hypocrisy. Was quite an interesting read! Well, I hope this works but our government and its policies do not help matters at all...thanks Alex. I was wondering where you'd gotten to. Noted and posted. 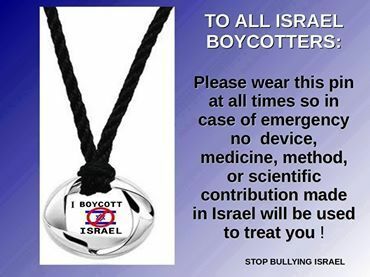 A person wearing one of those while experiencing a health emergency would learn very quickly that there are so many Nobel laureates from among the children of Israel and why this makes a difference. Also read in this context this article and the comments to it! Bye-bye Freedom of Expression and Speech!! Yes, Israel has made some important and vital contributions to science and medicine - but so did Nazi Germany and the Soviet Union. Werner von Braun was instrumental in getting the Apollo missions to the moon. The real target of the boycotts is Israel's current government and its policy of ethnic cleansing. Israel has every right to exist, but not to obliterate the Palestinians. You ask why covert? Everything illegal - like occupation, land theft, thuggery, killing, maiming, terrorizing civilians, etc. - needs to be covert. That's exactly what BDS is fighting against. And it will succeed - remember South Africa!! You're right, Freya, with each one of your points!! When I read this whining I often ask myself how the world existed before Israel came into existence ... seems we all lived in the very dark ages ... wonder how we survived for so many millennia??!! My views on garbage like the boycott Israel movement are fairly well known. there is absolutely no difference between overt and covert attacks on Israel in terms of the strategic goal, which is to destroy Zionism as a movement and the state of Israel as a nation. It is directed against anyone who feels that Jews should have equal status in the community of nations. It is born by jealousy, hatred and religious arrogance and extremism.It is always anti-Semitic in nature. Unlike the anti-apartheid campaign against the South African apartheid government in the1990s which I was involved in which was not directed against an ethnic group, this is directed against all Jews and their right to a homeland. I applaud Israel's efforts to combat this using all tactics necessary short of physical violence. In my book hate speech and expression are not protected forms of freedom of speech. I know some of you feel differently.It is wishful thinking indeed to think that extremists bent on physical harm should be allowed this leeway as Hitler was with Mein Kampf. Spot on Cal. In my book too, a huge difference between freedom of speech and being free to incite violence against Israel, Israelis. If these zealous antisemites don't want Israel to interfere with policies in their countries, it's a no-brainer why they insist on sticking their noses in ours and somehow seem to think we're just going to nod our heads politely and smile .. If I had a penny for every comment by an antisemite complaining about Israeli policies, I would be a millionaire .. But typical, it is not enough for them to keep their noses in their own country's policies, they have to lay eggs about Israeli policies too, even if they have never even visited Israel, nor know anything about the truth going on in my country .. The antisemites' behaviour would have been laughable was it not so zealously insane ..
We are one people, citizens of our Earth....solid dimension.There are other dimensions as scientists and mystics agree. to do was wave your hand and he would be a mewling calf. Everything was perfect and without purpose. "any thing is better than nothing"....,the sage said. We increased sensation which became pain. We increased competition and became enemies. We created a solar system of problems. And we forgot how to do the math. How are we to find peace? what affects you, affects me. we realize a strange feeling of --- of what? E motion. Energy in motion......competing with one another. Energy in motion......we begin throwing things and ideas and mockery at each other. NO! NOT that way. This way. My way. You lose. continuing to believe that we can change our destiny as a planetary people. Earth's people have not yet realized how much higher are the inner dimensions. We are one people, citizens of our physical dimension. There are other dimensions as I have learned and scientists are discovering.......Scientists and mystics are agreeing. What's it all about? It's all about drama.